Thank you for joining us for another cartridge showcase! Today we have the amazingly talented Chef Jenny here showcasing the Paper Play Cartridge!! *I used some Peachy Keen Stamps, embossing powder, and Copic markers to embellish this cut. *Here is how the bookmark looks opened up. The next project I have to share is a little home decor project. 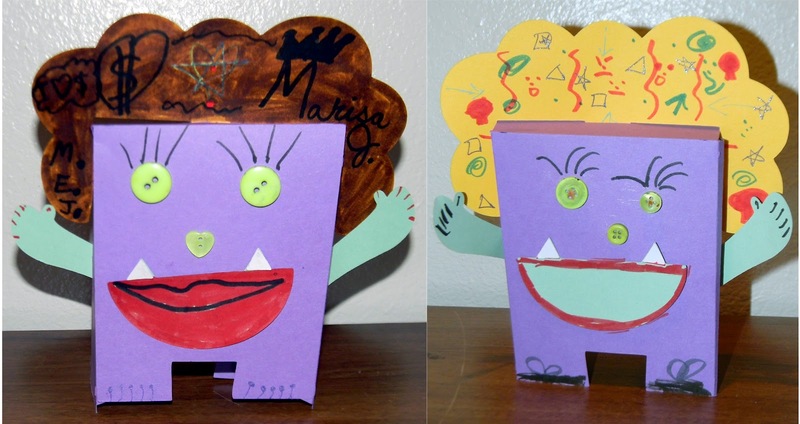 These cute little monsters are very easy to put together, and super fun to embellish! *These would be so fun for a cute, friendly Halloween decoration. Or use some birthday themed patterned paper, and give your "little monster" a MONSTER of birthday decoration! *I even made a couple of them with my kids! *First, cut out all the pieces. The large square is the base cut with the fold marks on it. *Even if you've never folded one of these before, these fold marks make it MUCH easier. The folding directions are in the handbook. *I would recommend using patterned paper, or a thinner piece of cardstock as a piece that is too thick would be harder to fold. *Once you do all the folding, your piece should look like this. *Here is the game base once it's completely folded. *After folding, you need to put the numbers on. *Check the handbook to see where to adhere them. *Then you attach the fun faces that come with this cut onto the outside diamond shapes. Thse were fun and easy to put together! If you think Chef Jenny did as awesome of a job as I do, then head over to her blog and leave her some love! What super cute projects Jenny! Thank you so much for sharing with us and inspiring us to "PLAY"!!! This is so cute. My cartridge should arrive today. This one looks like a lot of fun. Your girl card looks so cute. What cute projects. I just want to pinch those little cheeks on that cutie little girl. These are so great! TFS! !